Associate Professor Michel Cukier has been named the inaugural Director of the Advanced Cybersecurity Experience for Students (ACES) at University of Maryland, the nation’s first undergraduate honors program in cybersecurity, representing an innovative new model for cybersecurity education. Dr. Cukier is Associate Professor of Reliability Engineering in the Department of Mechanical Engineering and Associate Director for Education in the Cybersecurity Center at the University of Maryland, College Park. Dr. Cukier received a degree in physics engineering from the Free University of Brussels, Belgium, in 1991, and a doctorate in computer science from the National Polytechnic Institute of Toulouse, France, in 1996. Before coming to Maryland in 2001, he was a post-doctoral fellow and then researcher at the University of Illinois, Urbana-Champaign. His research covers dependability and security issues. 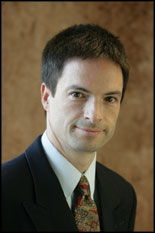 His latest research focuses on the empirical quantification of computer security. He has published over 70 papers in journals and refereed conference proceedings in those areas. For more information about Dr. Cukier visit his faculty page. The ACES program was initiated with a gift of $1.1 million from Northrop Grumman as part of the Business Higher Education Forum initiatives. The curriculum consists of two linked academic programs over the course of four undergraduate years, a freshman-sophomore living-learning program (ACES I) and a series of upper-level courses and experiences for juniors and seniors (ACES II). This elite program will enable 40-45 students per class to interact with and learn from campus faculty and industry and government professionals developing cybersecurity technologies, policies, and strategies. Integrated learning in computer science, engineering, business, public policy, and the social sciences will help train a new cadre of “cyber-enabled” leaders. For a company like Northrop Grumman, whose cybersecurity practice encompasses business units targeting a wide range of sectors (e.g., the financial and healthcare industries), this program will produce graduates with diverse backgrounds who will be ready to anticipate and respond to the challenges in cyberscurity not just in the present, but also in the future. ACES freshmen and sophomores will reside in the new Prince Frederick Hall beginning in fall 2014. This new residence hall is designed to accommodate the unique needs of ACES students with state-of-the-art technology-rich classrooms, laboratories, and study spaces. During the 2013-14 academic year, the first-year students and program offices will be located in the Ellicott Community, where four other Honors College living-learning programs are located. More information and press releases about ACES are available here.